Mexico's geography in the Press Comments Off on Incarceration in Mexico: distance decay from California? According to Coneval, 53.3 million Mexicans (45.5% of the total population) were living in poverty in 2012, compared to 52.8 million (46.1% of the then population) in 2010 and 48.8 million Mexicans (44.5%of the population) in 2008. Note that poverty statistics prior to 2008 in Mexico were generally based purely on income levels. From 2008, this method was replaced by a multidimensional index. The precise details of the index have been modified slightly since that time, making exact comparisons between 2012 and 2008 more problematic. While the precise numbers are subject to debate, mainly due to differing definitions of what constitutes “poverty” and how it can be measured, the trend revealed by the Coneval numbers is supported by the Economic Commission for Latin America and the Caribbean (ECLAC) in its “Social Panorama of Latin America 2013“, published in December 2013. The ECLAC report found that Mexico is one of a very few countries where poverty levels rose between 2011 and 2012, from 36.3% of the population to 37.1%, according to its definition. The dire situation in Mexico compares to a slight decrease in poverty in most larger Latin American countries, including Venezuela, Ecuador, Brazil, Peru, Argentina and Colombia. In absolute terms, according to ECLAC, 164 million people were found to be living in poverty in Latin America, about 57.4 million (35%) of them in Mexico. 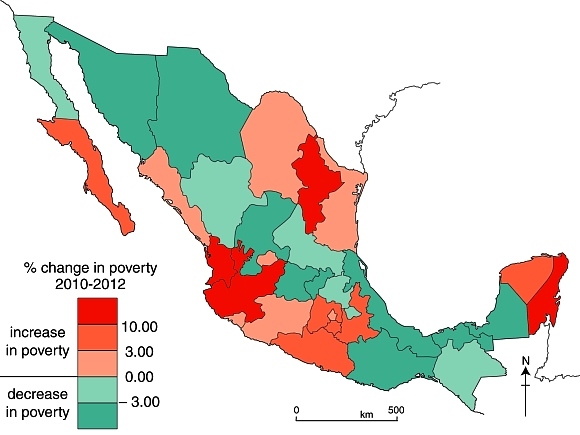 The map shows the Coneval data for changes in the poverty rate between 2010 and 2012 by state. It appears that poverty levels increased in many of Mexico’s more prosperous areas and in the longer established industrial areas, as well as in almost all areas where tourism is important. 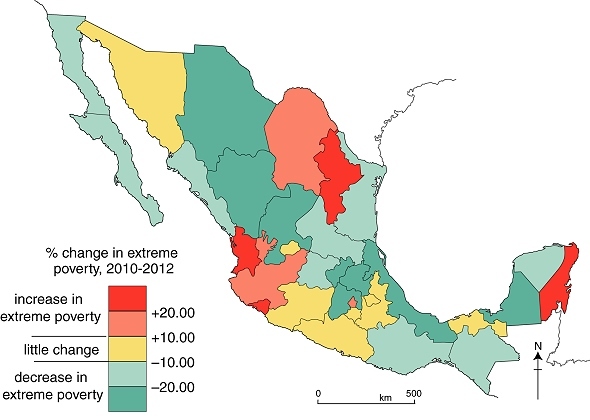 Poverty decreased in some of Mexico’s more rural, and generally poorer, states. 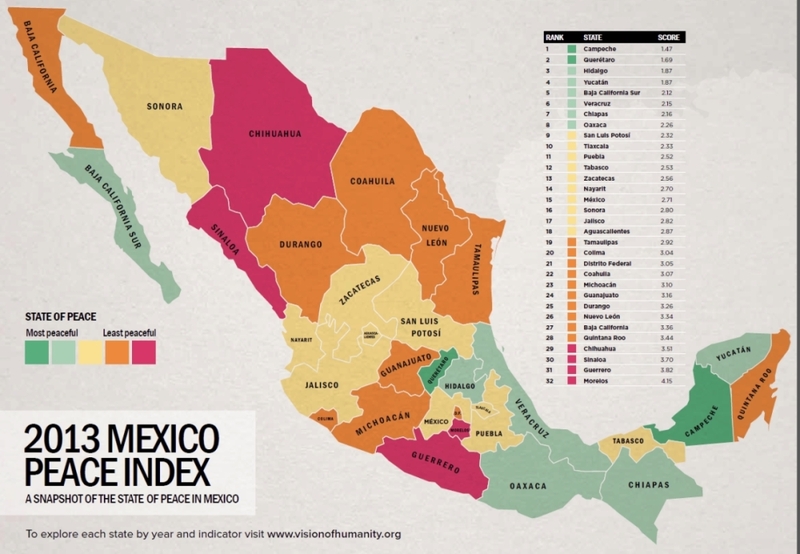 The Institute for Economics and Peace (IEP), an independent, non-profit research organization dedicated to promoting a better understanding of the social and economic factors that develop a more peaceful society, has released its first Mexico Peace Index. The 2013 Mexico Peace Index (MPI) is based on a similar methodology as previous IEP indices, including the United States Peace Index and the United Kingdom Peace Index; however specific measures were included to better reflect the specific Mexican cultural and national context. For the Mexico Peace Index, seven indicators were used to analyze peace: homicide rates, violent crime, weapons crime, incarceration, police funding, efficiency of the justice system, and the level of organized crime. The study was performed with the guidance of an Expert Panel representing various institutions such as IMCO, CIDE, Mexico Evalua and INEGI. The Mexico Peace Index 2013 uses data provided by INEGI and the Executive Secretariat of the National Public Security System (SESNSP). Mexico Peace Index. Credit: Institute for Economics and Peace. 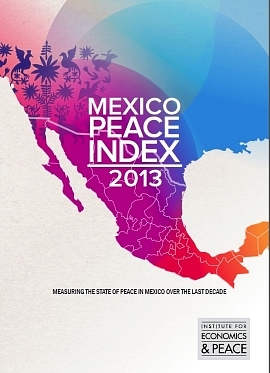 The 2013 MPI provides a comprehensive assessment of peace in Mexico detailing the level of peace in each of the 32 states over the last 10 years and an analysis of the costs associated with violence as well as the socio-economic dimensions associated with peace. The full 96-page report – available here – is well worth reading and offers many more insights into the changes taking place in Mexico. Two recent studies shed an interesting light on the distribution of wealth in Mexico. The first, carried out by the the National Statistics Agency (INEGI) is that agency’s first ever analysis of Mexico’s social classes. The study found that 12.3 million homes and 44 million people (39% of the total population) were “middle class” in 2010, up from 35% in 2000. In urban areas, 47% of the population was middle class, compared to just 26% in rural areas. 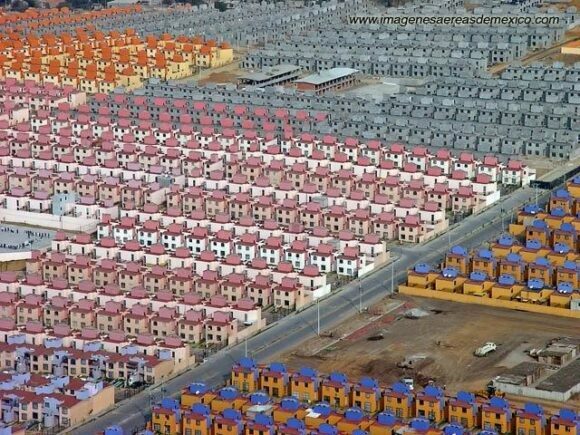 Middle class homes had at least one computer, spent about 115 dollars [1,470 pesos] a month on eating and drinking outside the home, had at least one resident with a credit card and one with formal employment. In most cases, the head of household had gained a tertiary qualification. The same report found that almost 60% of Mexico’s population matched the criteria for “lower class”, while only 1.7% of the population could be best described as “upper class”. However, a second study, by consultancy WealthInsight (“Mexico Wealth Book: Trends in Millionaire Wealth“) provides compelling evidence that the number of wealthy and super-wealthy individuals in Mexico has risen sharply. From 2007 to 2012, during the administration of President Felipe Calderón, the number of millionaires in Mexico rose by 32%, whereas the global average for the same period (which included economic recession in the USA and Europe) declined by 0.3%. WealthInsight found that in 2012 Mexico had 145,000 individuals with a “High Net Worth” (defined as over a million dollars in assets besides their principal residence). Together these high net worth individuals hold a fortune of $736 billion, equivalent to 43% of Mexico ‘s total individual wealth. This number is well above the worldwide average of 29%, indicating that Mexico has a relatively uneven distribution of wealth. What’s more, WealthInsight expects the trend to continue and predicts that by 2017, the number of millionaires in Mexico will grow a further 47% to reach 213,000.
million and $100 million) and 252 “centimillionaires” (net assets between $100 million and $1 billion). Mexico also has 16 billionaires, a number expected to rise to 21 by 2017. Grouped together, these ultra high net worth individuals are worth $364 billion in total combined wealth. By 2017 the total wealth of multimillionaires is projected to increase by 44% to reach $525 billion. The report predicts that the total wealth of Mexican billionaires will grow by 26% to reach $241 billion by the end of 2017. The Mexican city with most multimillionaires is Mexico City; 43% of them make their home there.